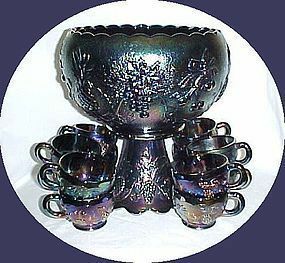 This beautiful Purple Carnival Three Fruits 14 Piece Punch Bowl Set was made by Westmoreland Glass. This was a limited production set. This Set consists of the Punch Bowl, Base and 12 Punch Cups. The Bowl and Base together measure 11 inches high. The Bowl is 10 1/4 inches in diameter. The Cups each measure 2 1/4 inches high X 3 1/8 inches in diameter. All 14 pieces are signed WG and are in excellent condition with no chips or cracks. This would be a beautiful centerpiece for any party. Be sure to search our other Westmoreland available. We guarantee all items to be as described. Feel free to email with any questions. THANK YOU.